During National Volunteer Week, we express our deepest gratitude to all the dedicated individual volunteers and groups that make our House a home. We continue our 40th Anniversary celebration by sharing the story of the first Ronald McDonald House of Cleveland volunteer, Willa Jones. The East Cleveland grandmother, just shy of her 65th birthday, became the first Ronald McDonald House® of Cleveland (RMH) volunteer and set the standard for unconditional caring exemplified by RMH volunteers to this day. The Plain Dealer profiles Willa Jones in 2004. Although Willa’s pain may not have been the motivation for her long-standing commitment to the House, it may explain the gentle reassurance and quiet comfort she was able to provide to countless anxious families, and to her favorite House activity: rocking babies. Willa’s empathy, gracious customer service and unwavering dedication, coupled with her trust and positive support of the House staff and leadership were qualities that inspired the establishment of the Willa Jones Award during RMH’s 25th Anniversary year. The award recognizes a House volunteer who exemplifies these characteristics. Generations of Willa’s family, from granddaughter to great-great-granddaughter, attend the annual volunteer appreciation event to help present the award. Winners’ names are embroidered on a quilt that hangs behind the House reception desk where Willa spent thousands of volunteer hours. The fabric display was designed in lieu of a traditional plaque to better represent the softness and warmth of her spirit. “Willa was also always chilly and liked to use a lap quilt,” recalls Joanmarie Button, Willa’s fellow volunteer and current Director of House Program Operations. Willa Jones’ granddaughter, great-granddaughter, and great-great-granddaughters Demetria Webb, Na’Tasha Webb-Prather, and Sha’Naya Howard with 2018 Willa Jones Award Honoree, Dave Williams. During this hallmark 40th year of the Ronald McDonald House of Cleveland, we celebrate Willa Jones’ contributions by remembering and thanking the hundreds of cherished volunteers who have followed in her footsteps. One of them connects us to our history in a very unique way. Demetria Webb, one of the granddaughters Willa raised, is honoring her grandmother by becoming a volunteer at the Ronald McDonald Family Room® and Hospitality Suite at MetroHealth Medical Center. Willa’s legacy truly lives on. Willa Jones 95th Birthday Celebration at the Ronald McDonald House of Cleveland. Just prior to National Volunteer Week, Joanmarie Button appeared live Wednesday, April 3 on WKYC’s Live on Lakeside to share Willa’s story and how volunteers support the RMH mission. She was also interviewed by Leon Bibb for We the People, which aired Friday, April 5. February 20, 1979, from left: Joseph Benden, president of the Northeast Ohio McDonald’s Operators Association; Don Smith, McDonald’s owner/operator and VP of Children’s Oncology Services of Northeast Ohio (COSNO, RMH founding organization); Stephen Zayac, president of COSNO. Everyone loves a treat, and the McDonald’s Shamrock Shake doesn’t disappoint. Since its introduction in 1970 as the St. Patrick’s Day Shake, the frosty green drink has developed a cult-like following, inspiring websites, story lines in popular TV shows, and even a shake-tracking app. But aside from the pleasure of enjoying the seasonal beverage, the Shamrock Shake has helped provide comfort to thousands of families when they needed it most. 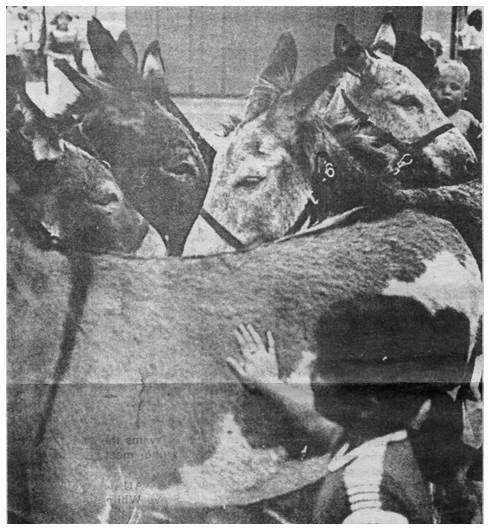 Forty years ago this week, thirty cents from the sale of each Shamrock Shake in Northeast Ohio was earmarked for the purchase and transformation of the College Motel into the Ronald McDonald House of Cleveland. The Northeast Ohio McDonald’s Operators Association had been approached to help fund a House in Cleveland, and embraced the idea so enthusiastically that they voted unanimously to make a $150,000, three-year pledge. The Shamrock Shake promotion was the first in a series of events to fulfill that pledge. The special ran from March 5 – 17, 1979 and with additional in-store donations raised more than $87,500, the equivalent of more than $300,000 today. — Stephen Zayac, president of COSNO, 1979, speaking about his budget presentation to request funds from McDonald's owner/operators. The Ronald McDonald House of Cleveland isn’t the only one to benefit from the proceeds of the minty green shake. In fact, the drink can be said to have played a role in the naming of the very first Ronald McDonald House, which opened in Philadelphia in 1974. In the early 1970’s, Philadelphia Eagles player Fred Hill’s daughter Kim developed leukemia. When Kim recovered, Fred decided he wanted to do something to help other families whose children were in the hospital. Jim Murray, General Manager of the Eagles, contacted Dr. Audrey Evans of the Children’s Hospital of Philadelphia, who told him that families of pediatric patients needed a place to stay nearby so they could be rested and better able to support their children. Hill, Murray and Evans approached Ray Kroc, Founder and CEO of McDonald’s, who donated $25,000 seed money to the project. The local McDonald’s owner / operators and their advertising agency agreed to assist in funding the project with promotions involving the Philadelphia Eagles. McDonald’s Regional Manager Ed Rensi then agreed to donate the proceeds from the region’s upcoming Shamrock Shake promotion if the new facility was named the Ronald McDonald House. 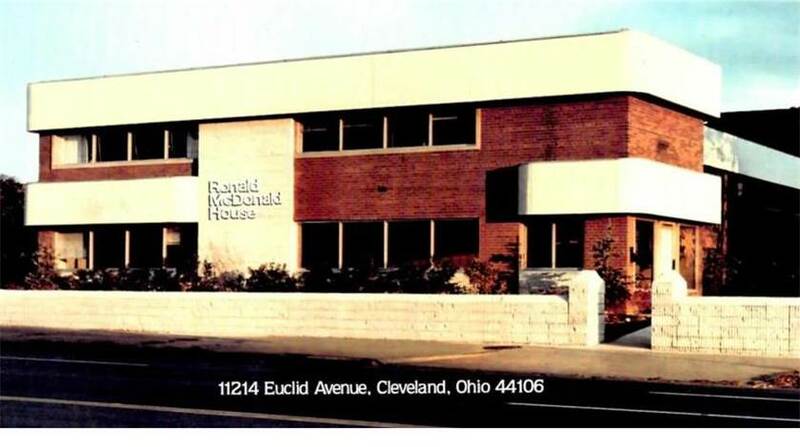 While the Ronald McDonald House of Cleveland is an independent charity and is neither owned nor operated by McDonald’s, the integral role they played in its founding continues to this day. Since their initial pledge forty years ago, McDonald’s Owner/Operators of Northeast Ohio have supported the House with significant contributions to its growth, including a substantial donation in 2011 toward the expansion and renovation of the current 55-family House. For forty years, local McDonald’s franchisees and employees have also been involved as board and committee members, donors and volunteers. This vital support has enabled the Ronald McDonald House of Cleveland and its programs to provide a welcoming place to stay and crucial resources and services to thousands of families, helping them remain strong to care for their children. This year, as we celebrate our 40-year legacy of love, we share the stories of our history and pay tribute to those whose vision made it happen. We also share our deep appreciation to those whose past and continued involvement keeps our mission thriving. To all of you, we raise a glass of Shamrock Shake. Sláinte! Corporate partner support is part of the ‘magic’ formula that has allowed the Ronald McDonald House of Cleveland (RMH) vision to thrive for the past 40 years. Ongoing philanthropic and volunteer engagement from partners brings life to spaces, programs and services to help families stay strong for their children. One of our valued partners, Majestic Steel USA, opened its doors in 1979, just as we did. In honor of our shared 40th Anniversary year, we spotlight Majestic Steel USA’s Majestic Impact on RMH. Aromas fill the air of the Ronald McDonald House of Cleveland (RMH), drawing families to the kitchen for a peek at what’s on the menu. After two years of volunteer groups from Majestic Steel USA cooking monthly meals, the families fondly came to know the third Monday of the month as Majestic Monday. A freshly prepared meal is one of the many caring touches they could count on because of the generosity and service of Majestic Steel USA. According to RMH Group Partnership Manager, Scott Lovasz, the volunteer groups have not only prepared meals, but have tirelessly done indoor and outdoor chores, gardened, painted fences, and even entertained guests with a Majestic Magic Show. Being the sole sponsor of the Pull Tab Collection Program inspired Majestic volunteers to come out to the annual Pull Tab Palooza each May to weigh jars and barrels of donated tabs, serve hot dogs, play games, and create crafts with families and community members. “It was great to know we could always count on their participation, rain or shine,” shares RMH Communications Manager and coordinator of the Pull Tab Program, Nathan Enzerra. Majestic Steel USA team at Wine Women & Shoes benefiting Ronald McDonald House of Cleveland in 2018. Interested in how your company can play a role in supporting Ronald McDonald House of Cleveland families? Opportunities can be customized to fit your company. Contact Kelly Kleinschmidt, Director of Development to discuss options. Up in the sky! It’s a bird… it’s a plane… it’s 4,000 comic books making their way to the Ronald McDonald House of Cleveland! Bob Watson has been reading comic books for as long as he can remember, and began collecting them around the age of 8. Over the years, he found hope and inspiration in the journeys of the heroes he followed as they battled numerous villains and overcame personal struggles. His love of comics really began to soar during high school when his mom bought him Spider-Man #1, which at that time was already a much sought-after comic book. During the 1980s, Bob began collecting comics in quantity. From Marvel to DC, he amassed more than 4,000 comics that followed the likes of the Avengers, Batman, Wonder Woman and Star Wars. 2008 Superman Celebration with 122 fans dressed as Superman to set World Record. Bob was the only BALD Superman! As the years went by, Bob’s efforts collecting comic books slowed as he started a family and worked as a letter carrier. Never far away though were the comic books and the tales of heroes from around the galaxy. As Bob’s daughter, Sarah, grew, so too did her love for comic books. What was once just Bob’s passion turned into a bonding experience between father and daughter. Sarah has since turned her passion for comics into professional works as she’s honed her skills drawing everything from animals at the zoo to entering an art contest in 2007’s Superman Celebration in Metropolis, IL. As the nation’s interest in comics began to explode in the early 2000s with movies like X-Men and Spider-Man, so too did the desire for people to want to meet these heroes in person. Bob eventually would go on to dress up as Lex Luther, Superman’s arch nemesis, and even as Superman himself. Various other super hero groups began to emerge, one of them being Super Heroes to Kids in Ohio, a nonprofit whose mission is to spread good will through simple acts of kindness and recognize individuals who’ve battled through adversity, all while being dressed as the most iconic super heroes. The group has since become partners with the Ronald McDonald House in 2016, hosting super visits and activities for our families once a month, annually sponsoring guest room 218, attending events like Pull Tab Palooza in 2017 and 2018, and raising awareness, funds and countless smiles and laughter for the House. With Bob’s collection of comic books totaling more than 4,000, he and his family realized that it was becoming increasingly difficult to move so many books. Looking for a home where he could donate his comics so that others could get as much joy out of them as he and Sarah did, Bob found the Ronald McDonald House of Cleveland, who then invited their amazing friends from Super Heroes to Kids in Ohio to welcome Bob and his donation of comic books. Since Bob’s generous donation, Ronald McDonald House and Super Heroes to Kids in Ohio have given many of his books to families and kids who are embarking in their own journeys of adversity. Within the books they are able to find examples of strength and hope that help them in their own battles. Please join us in thanking Bob and Super Heroes to Kids in Ohio for their generosity, support and for being super inspirations for our very own heroes of the House! Excelsior! Despite more surgeries and hard work ahead, Katie, Robb and Alesia are thriving and once again face a bright future. The study of Katie’s face will aid in the development of improved treatments for injured soldiers. Please give today to help us support all Ronald McDonald House families on their journeys of healing. Many bears. One message of love, kindness and compassion. This was the message that Evan Burgess brought to the world each day. Whether it was through an interaction with a stranger, or with a friend he’d known for years, Evan always carried a sense of optimism and happiness with him no matter the circumstance or situation. Evan was born on September 4, 1994 with a heart condition that caused only a portion of his heart to function properly. With the outlook grim, doctors gave Evan only two years to live. Evan’s father Chris and his mother Bonnie brought him home from the hospital knowing the challenge ahead, yet unwavering in their optimism that Evan would grow up to lead a fulfilling life. Two years turned into four, four into eight, eight into sixteen, and eventually Evan became a young man beaming with passion and love for life. However, Evan’s heart condition was always looming and led to many medical challenges and long rides to and from hospitals for lab tests. While his heart condition didn’t slow him down, it gave Evan and his family the perspective that life is precious and every moment is one to be savored. Always moving forward in life, Evan lived in London, Vancouver and Cleveland. Everywhere Evan went he developed close friendships that became like family and helped others see the best in themselves. In one instance, when a friend of Evan’s told him that she was considering committing suicide, Evan provided solace by saying “If you’ve had the worst day of your life, the day is going to end, and it will be tomorrow soon. It doesn’t stop what happened, but each day puts some distance between you and that really awful day, it becomes easier.” In the words of his friend, “Evan made me feel loved, not alone or as broken. I can’t express how much that meant to me.” In the short time he was in Cleveland, he fell in love with the city and decided to make it his home. He went on to work at Becky’s Bar, where he met his girlfriend, Liz, and made many friends. Sadly, on the morning of October 17, 2018, Evan passed away from his heart condition. He had just turned 24. During his life, Evan touched the hearts of many children and adults alike, leaving a special mark. He cared deeply for others, including his younger brother, Graham, and his cousins who idolized him. In search of a way to honor Evan’s memory, his family and friends started Evan’s Bears with the purpose of spreading his love and kindness to children dealing with medical issues. When searching for a place to donate bears to help cement Evan’s legacy of love, the family found a welcome home in the arms of children and their families staying at the Ronald McDonald House. More than 100 bears were collected at Evan’s funeral in Cleveland. His family from around the world visited the Ronald McDonald House to donate Evan’s Bears to families, proving that even without past connection to the House, a donation of kindness and comfort is always welcome. After their initial donation, bears continued to arrive at the House from people honoring Evan’s memory. Evan’s family aims to provide an annual donation of Evan’s Bears to the Ronald McDonald Houses in Vancouver, London and Cleveland, ensuring that his legacy of love and compassion lives on. Please join us in giving thanks to Evan and his family for spreading joy and happiness to hundreds of children and their families. Nearly 200 volunteers of the Ronald McDonald House, Family Rooms and programs were recognized for their contributions at the Annual Volunteer Appreciation Brunch on November 3. Guests gathered for a delicious meal and award ceremony at Stillwater Place, followed by strolls through the Cleveland Metroparks Zoo. Recognition of volunteers by years of service, from one to thirty, was followed by presentations for Volunteers of Merit and the Willa Jones Award. Willa Jones’ granddaughter, great-granddaughter, and great-great-granddaughters Demetria Webb, Na’Tasha Webb-Prather, and Sha’Naya Howard with 2018 Honoree, Dave Williams. The Willa Jones Award recognizes a House volunteer who, like Willa, is steady and unwavering in commitment to our mission. Willa offered her services before the original House officially opened. Willa volunteered from that time forward, with absences only because of her health or when a family member was in need. She “retired” from the House at age 93, after serving for 28 years. A Willa Jones Award recipient exemplifies Willa’s salt-of-the-earth manner of caring for families – without condition – with a soft and caring conviction. The honoree is someone who is positive about all that takes place, always trusting that staff and Board are making good decisions, and always willing to be retrained when changes take place. This person is quieter and doesn’t do big, bold, noticeable things, but is nonetheless the core of what makes the House so welcoming and effective. Dave Williams joined our team as a maintenance volunteer in December 2014 and transitioned to become a front desk volunteer in 2015. In less than four years, he has accumulated nearly 1,100 volunteer service hours, which doesn’t count his many shifts at special events, including Night at the Races and selling 50/50 raffle tickets at Bridgestone. Dave often covers additional weekend and evening shifts, arrives early or stays late to fill unexpected needs, and apologizes if he is not able to cover extra shifts. Dave was honored as a Volunteer of Merit in 2016, and continues to provide excellent service to families, in a quiet and caring manner. He is reliable and capable, and truly epitomizes Willa’s quiet, steadfast commitment to our mission. Janice has been a Front Desk Volunteer for over two years. She comes in weekly on Thursday afternoons and, many times, offers to work addition shifts, including holidays. With a constant smile but quiet demeanor, Janice is a chameleon of sorts in that she easily relates and fits in with all ages, including the young professionals on her shift who admire her greatly. She does whatever it takes to care of our guests, and for these reasons, cited and uncited, is a 2018 Volunteer of Merit. Debra submitted a volunteer application over four years ago because she had just begun a one-year sabbatical from her position as a professor of nursing. She said she wanted to help us, but was also “doing this for herself.” We expected her to leave us when her sabbatical concluded, but fortunately for us, she has continued weekly shifts in addition to the many other responsibilities she balances. At the beginning of her shift, she’s off and running, tending to the laundry, restocking supplies, prepping rooms, and not returning to the Front Desk until everything’s been done to her satisfaction. She often provides helpful feedback, always with the intentions of improving our services, always spoken with the utmost respect and kindness. We’re grateful for her efforts and continuing dedication and devotion. It’s especially impressive when a college student finds the time to volunteer, in addition to all the work and stress that comes with their studies and their co-curricular responsibilities. It’s even more impressive and somewhat rare when that same student continues to volunteer year after year. Ash is one of those rare students. For the past two years, he has volunteered at the Front Desk weekly while also juggling a job. He is compassionate, kind and giving, dependable and responsible, with aspirations for a career in medicine. We’re grateful he chose to spend his limited free time helping our guests and proud he’s part of our team. Mary came to us though the South Euclid Garden Club. Her “Dirt Date” (the day she started her work in the garden) was June 5, 2008 at precisely 9:30 a.m. – per Bobbe Katzman’s orders! She has been a diligent and committed member of our garden volunteer team each week. She brings a wealth of horticultural knowledge, is a meticulous weeder, and a has keen sensitivity to our mission. Most of all, she has a full understanding of the purpose of the gardens, and what they mean to our families. Lauren began volunteering in the Ronald McDonald House kitchen early in 2018. Her original schedule was 5-8pm on Tuesdays and Thursdays, but when she quickly realized the House was in need of more help she jumped at the opportunity to volunteer more of her time to assist. She switched her shifts to 3-8:30pm to help with groups, and cook sweet treats with kids staying at RMH. On top of providing help as a volunteer in the kitchen, she also volunteered at fundraising events including Night at the Races, Pack the Q, Ambassador Council Happy Hour, and Wine Women & Shoes. She also donates to help provide meals for the families when there are no groups to cook. Bob and Bonnie came to us in the spring of 2017 though a volunteer fair sponsored by the Jewish Federation. They are one of our valued couple teams here at the House. Bonnie is one of the famous Pantry Engineers – weekly she diligently sorts donations, readies lunches, organizes the pantry and storerooms, and much more … all with purpose and a smile. Bob is a key member of the equally famous Maintenance Team. Bob brings a calm capability to the team – keeping our guest rooms ready for incoming families, assuring that our carpets and common areas are clean, and so much more. Both Bob and Bonnie are always willing to do whatever it takes. They are a wonderful team and bring their deep dedication and purpose to the House and our families each week. Helen Rapp is an engineer manager who works full-time. She is a wife and the mother of three adult children, two of whom have special needs. Helen is also a new attorney, having pursued her J.D. from Cleveland-Marshall College of Law due to her desire to assist families of children with special needs navigate systems. Helen is an integral part of the the Red Treehouse project funded by the Ohio State Bar Foundation. She works on the project pro bono, using vacation time to volunteer at the house weekly, mentoring four law student interns. She spends many a night and weekend researching and posting resources, and authoring guides on legal and advocacy issues. Helen helps to organize webinars, participates as a panelist, staffs conference information tables, and co-presented at the National Family and Community Engagement Conference. She and her daughter Janie even shared their personal stories for Red Treehouse videos. Lynda embodies the true definition of volunteerism – a selfless devotion to something bigger than yourself. In addition to her regular weekly shift, Lynda Daugherty and her Solon Girls serve our Marc’s/Stancato’s meals each month. She also comes in to serve on holidays, including every Thanksgiving. Her commitment and significant service to families makes Lynda deserving of this honor. Mary also embodies the true definition of volunteerism – a selfless devotion to something bigger than yourself. To volunteer her six shifts a month in our Room, and two at the House, Mary Masters drives more than an hour each way. She truly represents everything that we are, and what we do. She truly gets it. She is a big part of our “Continuous Improvement” initiative in the Room, and has served many holiday meals, including on Christmas. She goes above and beyond for our families, earning her this honor. Elizabeth is a student at Baldwin Wallace University. Her physical challenges as a result of spina bifida have not kept her from doing anything she wanted, including pursuing a college degree and volunteering. She never shies away from any task in the Family Room, including supporting the families. She recently was asked to speak with a patient who had been informed of the permanent need to use a wheel chair. Elizabeth was an inspiration to the patient, providing assurance that a full life was possible, one filled with unlimited opportunities. 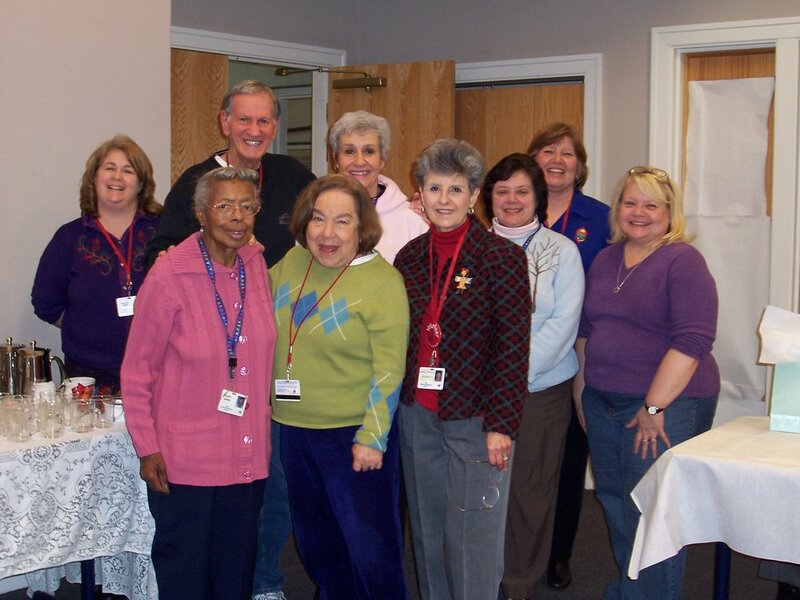 Ken has been volunteering in the Family Room for over five years in addition to volunteering at the House. He volunteers every week, picks up extra shifts, and comes in on holidays, when the Room is especially important to families. Ken helps in any way he can, adding to his normal duties by entering family registration cards and making small maintenance repairs. Ken is a dedicated volunteer who genuinely cares, as demonstrated by his ideas for improvement and the fact that he drives almost an hour to volunteer. Families love Ken as well. He makes everyone feel comfortable and is easy to talk with. He is a proud grandfather, beaming as he shares photos. Ken is also very humble, always brushing off compliments. Ken is truly appreciated and deserving of the volunteer of merit award. We are re-running this blog post from December 6, 2016 in memory of a dear friend of the House, Fred Close, who passed away on September 17, 2018. We are excited to announce that OUR POND, a series of original children's stories, is now available online. The stories are donated to the Ronald McDonald House by Fred and Angela Close. These hopeful stories, which encourage the animals to use their special skills to problem solve, were written by Fred, narrated and illustrated by Angela, and are cloaked with the beautiful music of Simeon Wood. Fred, who had no siblings, was lonely as a child, so he invented adventures for his stuffed animal toys. One day his father bought him the record, "Peter and the Wolf," a narrated story accompanied by beautiful music. He loved it so much he played it over and over again. He wrote several stories, and Angela narrated them. On a cruise in the Indian Ocean, they met Simeon Wood, who performed for the guests. Simeon loved the stories and volunteered to compose and play the music for all the animals. And the rest is history! Now a collection of five delightful stories recount the adventures of Nozzle, Jazz, Whizzy, Twitter, Zanzibar, Old Kate, Bubblebath, Shard, Snag, Clump, Sally, Posey, and Boing. Fred and Angela, who live part of the year in England, are forming a partnership with a Ronald McDonald House in the UK to share these stories with their families. They see the stories as a way to share their love with RMH families for many years to come. The Ronald McDonald House of Cleveland is honored to be called "home" by many of our guests. Below is note of gratitude from Sarah Markley, who stayed at the House with her daughter, Emma, as she went through a pain management program at a local hospital. "Hello, my name is Sarah Markley. For the past three weeks I have been staying here at the Ronald McDonald House with my oldest daughter, Emma. Almost a year and a half ago, Emma began with a headache that has never gone away. We live in a suburb outside of Philadelphia, Pennsylvania and are very fortunate to live near many outstanding hospitals. Emma was seen at DuPont Hospital in Wilmington, Delaware and the Children’s Hospital of Philadelphia (CHOP). She turned 18 and was then able to be seen at Jefferson University Hospital. Despite the amazing care, Emma’s headache refused to go away. She was diagnosed with a chronic headache disorder called New Daily Persistent Headache, one that is untreatable and results in a lifelong condition of daily chronic pain. It was on the one year anniversary of Emma’s headache that my husband, John, and I began to realize that we could not let our sweet daughter continue to allow this headache to rob from her life. It was then that I read about the IMATCH program, a pain program specifically for chronic headaches, at the Cleveland Clinic. In May, John, Emma and I drove close to seven hours to meet the doctors and learn more about the program. It was during the drive home, we realized that this was the exact thing that Emma needed. She needed to learn how to live again despite daily, constant 7 out of 10 pain. The problem would be "How we were going to afford to live three weeks in Cleveland to get Emma that help?" Emma, you see is the oldest of our four children and over the past year and a half, she has had ER visits, two hospitalizations, and an extensive amount of doctor visits and many new medicines to try. All of this already weighed heavy on our wallet. When I shared all of this with the receptionist at IMATCH, she immediately suggested that we take a look at the Ronald McDonald House. Pricing out hotels even with a Cleveland Clinic discount, our stay would have been well over $3,000. Then add meals on top of that. We all agreed that the only way that we could get Emma the help she needed was if we were able to stay at the Ronald McDonald House. The day before we were to leave, we got the call that told us there would be a room in which we could stay. The next morning at 6AM, Emma and I set off to Cleveland,Ohio. Without donors, Ronald McDonald Houses cannot help families be near their children during unsettling times. You ensure that the Ronald McDonald House of Cleveland is ready and able to help these families during their time of greatest need…no matter where they are from. Help us continue to serve our families. The National Sports Collectors Convention (NSCC), the premier showcase event of the sports collectible industry, has chosen Ronald McDonald House of Cleveland (RMH) as the charity partner for their 39th Annual show! The convention runs August 1st through 5th at the Cleveland IX Center. Highlighting NSCC’s support is the donation of a Once in a Lifetime VIP Experience for one lucky RMH family. The VIP prize includes a personal behind-the‑scenes tour of the show, meet and greets and photo-ops with superstar athletes and entertainers, limited edition trading cards, free autographs and a personal $3,500 shopping spree to purchase some great signed memorabilia and trading cards from exhibitors on the floor of the NSCC, thanks to The Industry Summit, Beckett Media and HandBid Auctions. Update! Photos from the NSCC VIP Experience winners, the Fritz Family. See more here. HandBid, a mobile app auction platform, is donating their services for the online auction of sports memorabilia. The NSCC Auction is now LIVE and is scheduled to close Saturday night, August 4th at 9 pm E.T. Items will continue to be added throughout the convention. Anyone may bid on auction items, and need not be present to win. RMH and HandBid will also be on-site, at the show, sharing exhibitor booths #963 and #1063 in the NSCC corporate area. And that’s not all! RMH families will be guests of NSCC and the IX Center at Friday’s Cleveland Indians game. One family will be on the field with NSCC and RMH representatives for the check presentation prior to the game. For more information about the show, visit www.NSCCShow.com. Stay tuned to RMH social media for live streams, photos of the winning families and more from the NSCC! Cleveland is a foodie town, and in the past decade the food scene has exploded. Thanks to social media, so has blogging about the best treats and eats in town. We often turn to these social media gurus to point us in the direction of where to eat and what to order, as they showcase the best eateries around. The RISE & Dine meal program, which pairs Cleveland Chefs with volunteer groups, is relatively new but has already made a significant impact not only in the lives of the families staying at the Ronald McDonald House, but in the community as well. Chefs volunteer their time to serve incredible food that offers variety and comfort to the families. The volunteers not only get to spend the afternoon learning from Cleveland’s top chefs, but they also get to help feed the families at the House. On July 10th, prominent Cleveland food bloggers volunteered their time, and social media skills, to the House by participating in a RISE & Dine experience with Melt Bar & Grilled founder, Matt Fish, and Director of Operations, Neil Sanchez. Under the guidance of Melt, the bloggers worked at five different stations to help prepare the evening’s meal. Given the summer season, the dinner was BBQ inspired and consisted of Melt’s famous Backyard BBQ Grilled Cheese sandwich (a vegan version was also prepared), potato salad, and watermelon salad. Following dinner, the group toured the House to learn more about the impact of their volunteerism. The RISE & Dine program is a unique experience, and the bloggers were able to combine their passion for food and Cleveland pride to raise awareness for the Ronald McDonald House and the program. Their involvement helped to make this extraordinary event memorable. “It was a fun and rewarding experience and [we] are looking forward to doing this again sometime in the future.” said Heena and Kushal Mistry of @KushFood. Know a group who would be interested in participating in a RISE & Dine experience to help feed families staying at the Ronald McDonald House? Click the button below and submit a Group Volunteer Form today! Keith Strauss, President of Sales Concepts and President of the Ronald McDonald House® of Cleveland, Inc. (RMH) Board of Trustees; Dr. David Roberts, Director of Pediatric Hospitalists, MetroHealth; Craig Richmond, SVP and CFO of the MetroHealth System and Member of the RMH Board of Trustees; Rebecca Bartnicki, Nurse Manager, PICU & Inpatient Pediatrics; Connie Eggleston, Nurse Manager, Neonatal ICU; Jessica Chupnick, Manager, Child Life and Education; Lydia Bert, Center Director, Women’s and Children; Alisa Powell-Stovall, Director of Community Program Operations at RMH; Craig Wilson, Executive Director of RMH; Bria Heifetz, MetroHealth Hospitality Suite Coordinator (not pictured). In many cases, families of pediatric patients are simply unable to leave the hospital, sometimes for days at a time. The newly-opened Ronald McDonald Hospitality Suite at MetroHealth Medical Center provides crucial overnight respite for families of the most vulnerable patients, just steps from their child’s treatment room. Located directly across from the PICU, the Suite features four private rooms spacious enough to accommodate up to three guests. Each is equipped with a bed, recliner, writing desk and mini-fridge. Guests are provided with a keepsake quilt and welcome basket filled with snacks, water, writing tablet, tissues and resource information. The rooms share a quiet lounge area with a TV, comfortable La-Z-Boy furniture, vending machines, private restroom and shower stocked with fresh towels and toiletry items. The Hospitality Suite opened on June 19 with a Ribbon-Cutting ceremony and tour. Speakers included RMH Cleveland Executive Director Craig Wilson, Board President Keith Strauss, Dr. David Roberts, MetroHealth Director of Pediatric Hospitalists, and MetroHealth President and CEO Dr. Akram Boutros. Mr. Strauss spoke of his personal connection to the Ronald McDonald House, which began years ago when he was a guest of RMH St. Louis following the premature birth of his son. Dr. Boutros talked about the growth and focus of the MetroHealth System and stressed the importance of supporting families as an integral part of caring for children undergoing medical treatment. Dr. Roberts echoed this, citing evidence that reducing barriers to parents’ active participation in their child’s care is a medical necessity. Attendees from room sponsors Quicken Loans and RSM, along with 45 other guests enjoyed cake and snacks, while learning how their generous contributions support the Ronald McDonald House mission of Keeping Families Close®. The Ronald McDonald Hospitality Suite at MetroHealth is the first in Ohio, and is expected to serve hundreds of people per year, free of charge. Just down the hall from the Hospitality Suite is the Ronald McDonald Family Room, which has hosted over 96,000 visitors since opening in 2010. Open from 9am – 9pm daily, the Family Room is equipped with a lounge area, full kitchenette stocked with snacks and beverages, children’s play area, computer with internet access, and other things that bring comfort to families so they can remain strong for their children. In addition to the Hospitality Suite and Family Room at Metro, Ronald McDonald House of Cleveland provides a home-like environment and essential resources and services for up to 55 families per night at our University Circle guesthouse and operates Family Rooms at UH Rainbow Babies and Children’s, Cleveland Clinic Children’s Hospital and Cleveland Clinic Fairview Hospital. All Hospitality Suite and Family Room Services are offered to families free of charge. For a room at the House, we ask for just a $20/night donation, but never turn away a family for inability to pay. With the help of our generous donors and dedicated volunteer force, we were able to serve over 109,000 individuals in 2017. For more information about our services or how you can become involved, visit our website at http://www.rmhcleveland.org or call us at 216-229-5757. The illness of a child can often tear a family apart; the stress for some being too difficult to bear, but for Cory Poling and Lori Irwin, it only brought their family closer together. When their daughter, Collins Poling, was two years old, Cory and Lori separated. Eventually, Cory moved up to Toledo, Ohio and Collins split her time living there with her father and in Decatur, Indiana with her mother. In late July 2016, Collins suffered her first grand mal seizure and was taken to a hospital in Toledo. She stayed at the hospital for 11 days while the doctors tried to figure out how to stop the seizures. When the seizures stopped, she was sent back to Decatur with her mother, while continuing to see a neurologist in Fort Wayne, Indiana. For almost a year and a half, things seemed to be getting back to normal; while the doctors were unsure of the cause of Collins’ seizures, she hadn’t suffered any recent attacks. However, that changed on December 22, 2017 when Collins had her second grand mal seizure. She was taken to the hospital in Fort Wayne and was tested to try to find the cause of her attack. After an extensive 24 hour EEG, the seizures continued but their cause was still unknown. The family was eventually referred to the Cleveland Clinic. It was a trying situation for Cory and Lori, having to come up to Cleveland to try to help their daughter, while not having any real information about the situation. When they contacted the Cleveland Clinic to make their appointments, they were also looking for a place to stay, and were referred to the Ronald McDonald House of Cleveland. Cory and Lori arrived at the Ronald McDonald House in mid-March and stayed for 12 days. While their daughter was benefiting from the care at the Cleveland Clinic, Cory and Lori benefited from the support system they had at the House. They were able to talk to volunteers, employees, and other families that had a child going through similar situations. Collins, along with her parents and grandparents, Barry and Judy Poling, returned to the House twice after that, once in May and again in June. On May 4th, it was discovered that Collins had a lesion in one of the grooves (sulci) of her brain, on a part that had not properly formed while she was in the womb. When they returned in June, Collins had the operation to remove the lesion. The Polings said that staying at the Ronald McDonald House put their minds at ease; from Grandpa Barry taking naps in the comfort of one of the Family Rooms in the hospital, to Cory, Lori, and Collins attending Cavs games, to meals provided to families by volunteers, the House was a major source of support. The House offered the whole family a way to relax and deal with their situation together. While this was a difficult situation for all involved, Collins’ family obviously grew closer. “Through all this, we’ve [Lori and I] reunited,” said Cory Poling. As a family, Collins, Cory, and Lori are moving on from one chapter in their life to a much happier one. Would you like to help make a difference in the lives of the families staying at the Ronald McDonald House? Just $20 helps to cover the cost for a family to stay the night at the House. Click the button below to donate today. Chris and his wife, Amie, knew something wasn’t quite right with Ryan. At age one, he was not developing at the same pace that his big sister, Sadie, had. He wasn’t reaching typical milestones like crawling and pulling himself up. Ryan’s physical therapist suspected he may have Cerebral Palsy, which his doctors later confirmed. Despite intensive physical therapy, Ryan’s physical progress plateaued, and he began to regress. The Delavegas learned of a doctor in St. Louis who performed a special surgery that might help Ryan. Without the surgery 5-year-old Ryan, who can walk short distances with the assistance of a walker, would eventually be wheelchair-bound. After Ryan was approved for surgery, Chris and Amie made plans to stay in St. Louis for the five days Ryan would be at St. Louis Children’s Hospital. The hotel they found was not ideal; they would be required to drive back and forth each day. When their friend, who works at the Cleveland Ronald McDonald House, found out about their situation, she told them about the Ronald McDonald House in St. Louis, which is a short walk to the hospital. With a little help from Cleveland, the Delavegas received an apartment at the Ronald McDonald House Charities of St. Louis. And the best news! Since his December surgery, Ryan has made remarkable progress. His muscles and joints are more elastic. He is able to stand on his own and has been taking his first unassisted steps. Despite a long journey ahead of them—four years of physical therapy 10 hours a week—the Delavegas are excited and encouraged that Ryan will someday be walking and jumping. Chris and Amie are looking forward to helping Ronald McDonald House families in Cleveland. “We so admire what you do for families and appreciate the support the Ronald McDonald House network has given to our family.” They are already signed up to volunteer their gift of time to RMH. At the Ronald McDonald House, volunteer groups come together each night to cook a delicious homemade meal that feeds as many as 55 families. This longstanding program allows volunteers to witness firsthand the Ronald McDonald House mission, which in turn has led to many fruitful relationships between RMH and the Cleveland community. In 2017, groups served 563 meals to families staying at the House. The meals, provided at no cost, save families much needed time and money. This allows them to better care for their child who is receiving medical treatment in area hospitals. Through the RISE & Dine program, groups donate money to participate. Local chefs are recruited to plan the menu and purchase the food. The group then comes together in the RMH kitchen to cook with the chef, serve the meal, and dine with the families staying at the House. Not only does the group enjoy a delicious meal, they get a culinary lesson too. The program currently has three core chefs; April Thompson, Andy Newman, and Sonia Steele. John Selick, visiting RISE & Dine Chef of the American Culinary Federation, and his family previously stayed at a Ronald McDonald House while his son was being treated for complications from autism. Recognizing the benefits the House has for families in a time of need, John helped co-create the program with RMH. RISE & Dine also utilizes local celebrity chefs to participate. On March 29, Matt Fish from Melt Bar & Grilled, who’s been featured on the Food Network, conducted a RISE & Dine at the House and made his most popular sandwich, the Parmageddon, which won USA Today's Best Ballpark Food contest, comparing stadium eats in Major League parks in 2016. Read the full RISE & Dine article by The Plain Dealer and get some great recipes created by our chefs. Volunteers from Verizon of Mentor join Melt in cooking a dinner for families staying at the Ronald McDonald House of Cleveland. Want to bring a group to the House to cook a meal? Visit our group volunteer page for more information. What value can you place on a glass of lemonade? Dr. Arthur Burns understood the healing power that one kind gesture could have on his patients. Dr. Burns dedicated more than 50 years of his life serving children as a pediatrician at Rainbow Babies & Children’s. Dr. Burns’ patients truly meant the world to him and his beloved wife of 70 years, Edwina. When pediatric patients were having a particularly difficult time, Dr. Burns would visit them with a special treat—lemonade or hot chocolate. It was his mission to lift children’s spirits when they were at their lowest. Dr. Burns passed away on February 26, 2016. He had lost Edwina a few years earlier. However, their legacy will continue to live on through charitable bequests they made in their estate plans to support organizations dedicated to providing pediatric care in the community. The Ronald McDonald House of Cleveland was the beneficiary of $10,000 from the Burns estate. We wanted to find just the right way to honor Dr. & Mrs. Burns’ legacy at Rainbow. Volunteers at the Ronald McDonald Family Room deliver gifts and snacks to families who cannot leave the pediatric ward. Volunteers visit the patient rooms and spread a little joy. Each year the Happy Wheels cart at Rainbow delivers happiness to nearly 2,500 patients and their families. We could think of no better way to honor them and their love for children than naming the Happy Wheels cart in their memory for the next two years. Guess what goody has been added to the cart…lemonade! The Burns’ gift not only touches our families and children, it touches the lives of the volunteers who deliver to the rooms. Here’s an example of their impact. “My name is Dana Lowrie, and I am a sophomore at Case Western Reserve University studying nursing. You may have seen me either working the front desk or pushing the Happy Wheels Cart. The Happy Wheels Cart is one of the most rewarding experiences I have been able to be a part of in the Family Room. Many parents that are staying with their children do not get the opportunity to come to the Family Room for various reasons. When we bring the Happy Wheels Cart onto the patient room floors, we are able to give the families light snacks and other items that help to make their day a little better. One of my favorite parts of Happy Wheels is getting to interact with the patients. I remember one time that I gave a child a teddy bear and it made her so happy, she could not stop smiling. Putting smiles on the faces of families and their children is one of the best parts of this job. Dr. & Mrs. Burns’ gift will impact nearly 5,000 Rainbow families. Visit our planned giving page, and learn how you too can make a difference in the lives of RMH families. Inclusion and celebrating diversity are important to the Ronald McDonald House of Cleveland. In 2017, we served more than 830 families from 17 countries, 37 states, and 63 counties in Ohio. Many families we serve speak only their native language. Couple the difficulties in communicating simple needs with the uncertainty of a new area and caring for their child, families can have an overwhelming experience. Recognizing the importance of the Ronald McDonald House, Katie Cirincione, a junior at Westlake High School and Girl Scout member, wanted to help. After learning about the House and the diversity of the families we serve, Katie decided to focus on the Ronald McDonald House for part of her Girl Scout Gold Award project. The goal of the 80-hour service project was to create something that has a lasting impact on the community. Katie has loved foreign languages for as long as she can remember. For her project, she decided to use this love to help enrich and strengthen the cultural diversity found at the Ronald McDonald House. In September 2017, Katie began collecting the foreign language books that would be placed in two language libraries: one for Westlake Porter Public Library to help inspire others to learn a foreign language and the other for the Ronald McDonald House guests to enjoy. Over the next several months, she received donated books from Westlake Porter Public Library, Half Price Books, Lorain County Community College, and family and friends. During the collection process, she learned more about languages she hadn't been exposed to and had discussions with friends about different cultures and topics they normally wouldn’t have explored. With the shelves of her language library filled with books, Katie made a visit at the end of February to deliver the library to families at the House. The language library, comprised of books in Spanish, French, German, Arabic, and other languages, is now proudly on display at the Ronald McDonald House and is helping the House feel more like home for our international guests. Katie hopes the libraries help inspire others to discover a love for language, one she hopes to continue to explore thoughout her life. Katie speaks Spanish fluently and is in her first year studying French. She would like to make a career using her skills in both languages. Katie's Girl Scout Gold Award project officially ends with a Culture Fair at the Westlake Porter Public Library on Sunday, March 18, 2-4 pm. All are welcome to this free event where there will be a story hour in different languages, the language library will be on display, and people of different cultures within the community will host informational tables. Sometimes dreams really do come true. On January 28, the Turner family from Sandusky received a surprise of a lifetime when Nino and his son, Zion, received tickets to the Cavs game from the Cavaliers ownership team. Little did they know that what they thought were regular seats turned out to be court side... right next to the Cavs bench! The Turners are currently staying at the Ronald McDonald House of Cleveland. Their oldest son, Jesiah, has been receiving treatment for water surrounding his brain, a condition he's had for nearly four years. Below are Bettyna Turner's words of thanks to the Cavaliers and the Ronald McDonald House for turning her family's dream into a reality. Jesiah (left) with brother Zion (right) as he holds Cavaliers player, Jeff Green's, shoes. I want share how much the Sunday, Jan. 28 CAVS tickets that were given to my husband, Nino, and our son, Zion, meant to my entire family. The day before the game I was leaving the hospital after visiting my 14-year-old son, Jesiah, who has been suffering with water on the brain for nearly four years. On the ride back to the Ronald McDonald House, where I am currently staying, I began having a conversation with God. I don’t really know if I was praying or just speaking out loud, but I chuckled to myself, and I began to remind God what HE is capable of: “God, I know you are able to do exceedingly abundantly above all that I can ask…” I went on to ask Him to give my husband, who is selfless and who works many hours to take care of us, something that his heart desired. I asked Him to sustain Zion, who is often left with family so that we can take care of his brother. Then, probably for the 10,000 time I asked for God to heal my son, Jesiah. The Ronald McDonald House gave Nino and Zion those tickets, and I consider that to be the direct answer to my prayer the day before. Neither my husband nor my son has ever been to a CAVS game. My husband had repeatedly mentioned that he wished to go, but it has not been possible with the extended health crisis of our oldest son. When they got to the game they were escorted all the way down to the floor to sit. They sat right next to the players! My small words cannot quantify the experience you all gifted a father and son. Our entire world and family were so happy Nino and Zion, two people who humbly endure the bad things in life, were experiencing something that would have never happened without the generosity of the CAVS and the Ronald McDonald House! Thank you! Jesiah, and I watched the game from his hospital room. He was so happy for his dad and his brother. As I write this, my eyes have tears. So many people who I cannot see and whom I do not know played a part in blessing my family with an unbelievable and unforgettable experience. Jeff Green took off his game shoes and gave my son his shoes! JR gave Zion his arm band. Derrick Rose signed an autograph and actually had a conversation with my husband. The way they were treated by everyone, the generosity of Jeff Green, JR Smith, and Derrick Rose is exceedingly and abundantly above what any of us could have asked. When the game was over, Zion brought Mr. Green’s game shoes to the hospital and put them on his brother's feet. Jesiah has been sick for a long time. He’s had 36 brain surgeries, and a rare stomach cancer. He suffers with chronic pain, and my faith was wavering and my heart was so heavy. This experience has helped me to know that God sees my little family, He hears my little prayers, and He feels the pain of my broken heart. I am reassured that He is still answering prayers and creating miracles. The same way God answered my prayer for Nino and Zion is the same way I expect Him to perform a miracle and heal my son: Exceedingly and Abundantly above all that I can think to ask. Help us continue to serve families like the Turners. The Ronald McDonald House of Cleveland is made possible because of the generosity and support of our community. Just $20 helps to cover the cost of a family to stay at the House for a night.